The Shamu Show has resumed today in SeaWorld San Diego, while devastated trainers and mourning fans do their best to put on a happy face. Yesterday, Tuesday September 7, 2010 the unimaginable happened in the SoCal theme park. 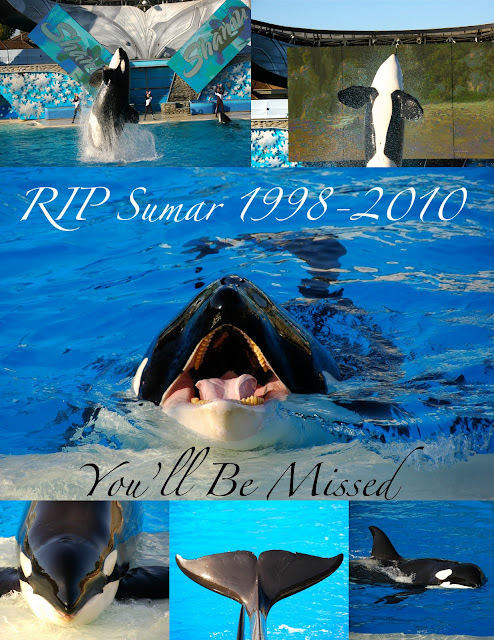 Sumar, star of the SHAMU Shows, passed away very suddenly & mysteriously. Sumar who was 12 years old, was born in captivity at SeaWorld Orlando in 1998. He was then transported to SeaWorld Ohio, for a short time. In 1999, he was transferred to his final home in SeaWorld San Diego. He was about 15 feet long and over 5,000 pounds. They say that orcas in captivity can live up to 25 years, up to 50 in the wild, making this young whales death even more of a shock. I'm a big fan of SeaWorld, an even bigger fan of killer whales. I feel connected to them in ways that even I can't explain. I am deeply saddened by the loss of such an amazing creature. To all of us who care so much about these animals, this is a very sad time. Thank you SeaWorld for giving us an opportunity to know Sumar. He will be missed. Here are some photos that I took, when I was there a few months ago. Little did I know it would be the last time I would see Sumar. Six killer whales now remain at the park. That makes me so sad...I have never had the pleasure of visiting Sea World. I only wish I could've had the chance to meet this amazing creature. Thanks so much for sharing this story Jess. I saw your photo on Fickr - I can't believe I didn't hear about him - ack ! I am sooo saddened these are my all time fav of all the creatures here on Earth. Great photos! Ps - I smiled at the similarity of our blogs I have the OC "f" word version LOL!